Food rationing is to be introduced in West Somerset – or at least advice on how to cope with feeding yourself and your family in times of shortage. The exercise actually is nothing to do with poor vegetable and fruit harvests caused by this summer’s hot and dry summer but a reminder of what it was like to face a lack of supplies through the Second World War. 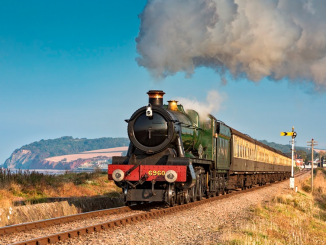 It is part of a spectacular 1940s Weekend event being supported by the West Somerset Railway on September 15 and 16 which will involve hundreds of enthusiasts, most of the stations along the line and the whole of Watchet. 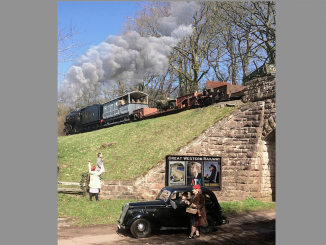 Lessons on cooking on wartime rations are being given at Crowcombe Heathfield station by members of the village W.I., while at the same time there will be celebrations of the highly-successful film Land Girls, which was partly filmed there. Three miles away, Stogumber station will be guarded by a four-barrelled 50-calibre anti-aircraft gun, while a large collection of wartime military and civilian vehicles will be either on static display at different locations, on the move between various activities during the weekend or transported on a specially-created military train running between Bishops Lydeard and Minehead on each of the days..
More wartime memories will be revived at Watchet by members of the town’s W.I. who will recreate meetings as they were at the time, using the original minutes, while volunteers at Washford station will stage a “Spitfire Fund” by collecting aluminium drinks cans. This time, though, instead of building fighter aircraft the metal will be melted down to make reproduction Somerset and Dorset Joint Railway tokens, as well as to raise money for the station and its historic collections. Scores of enthusiasts in American and British Service uniforms will be on duty to guard the line and man one of the pillboxes on the coast at Blue Anchor. A dance with 1930s and 40s music under the canopy at Minehead Station is already attracting a lot of attention, although tickets are still available from the WSR commercial department (tel. 01643 700406) and ladies can book a 1940s hair style to be created for the occasion in a salon being set up in a carriage at the platform. 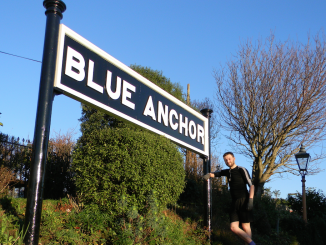 The weekend will also feature regular music and comedy from the war years at Minehead, Washford, Watchet, and Bishops Lydeard performed by nationally-known artistes. But event organiser Robin Wichard will have a special reason to feel proud: a number of iconic pre-war Austin Seven cars will be attending. The model was designed in 1921 by a relative, Stanley Edge, and they remained in production until 1939, with more than 290,000 sold. West Somerset was home to thousands of British and American troops during the war, and Mr Wichard says it is important to show today’s generations what those personnel and local people had to endure.